Footpool has taken the UK by storm this year so had to be added to our range of entertainments as soon as we saw it. The game combines Football with Pool and is played by two participants at time. It follows the same rules as pool where taking it in turns one player will try to pot all the striped balls while the other the spotted balls before they move on to the final black to win the game. Instead of using a cue you stand on the 'table' and kick the white ball against your balls to knock them into the pockets. Footpool is suitable for use by people of all ages and can be played indoors or outside. Footpool is a great activity for so many types of event. 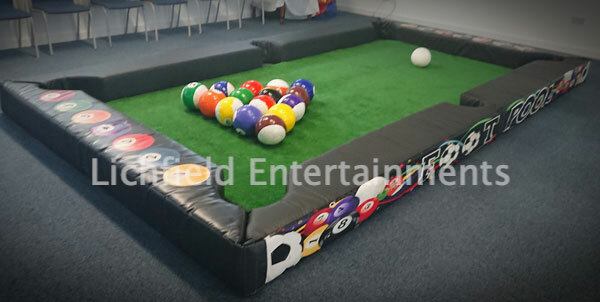 Perfect for pre or post-dinner entertainment as you can play whatever the dress code of the event, for schools and youth groups, fun days, and a great attention grabber for promotional events. You'll need an area of just 16ft long x 10ft wide overall and this needs to be level. The game can be sited on grass or hardstanding, indoors or outdoors. For outdoor hires we can provide an inflatable shelter to go over the game if required. No power supply is required for this game unless you are using the inflatable shelter or if lighting is required for evening events. If there is no electric supply available we can provide a generator. The game is normally supplied with a friendly member of staff who will oversee its use and referee if required. 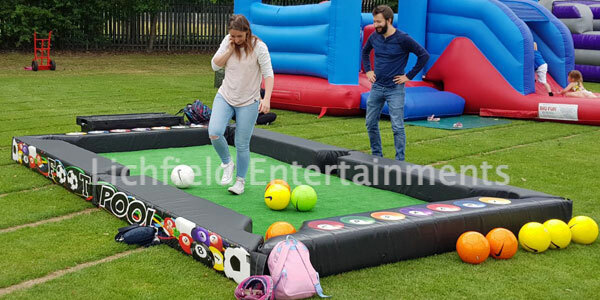 Other great football themed attractions to hire alongside Footpool include Giant Football Darts, Human Table Football, Rodeo Football, and Penalty Shootouts and Speed Cages. If you have any queries, questions, or would like to hire the Footpool game please click here to enquire and we will do all we can to help.